Text-enable your business phone numbers and open a new communications channel for customers and prospects. Take advantage of the popularity of text messaging. Send and receive SMS/MMS (text, pictures, video, documents) using MessagePro Office from any PC, laptop, tablet, or smart phone! Studies show that 95% of people read text messages within 15 minutes of receipt, making this app a game-changer for any organization. Additional features include logging, reporting, and, automatic replies. Amazingly inexpensive! TRY MESSAGEPRO OFFICE FOR FREE! ✪ No Credit Card Required. Start Sending Messages Right Now! Texting is a great addition to any service desk. MessagePro is amazingly versatile in meeting our needs. 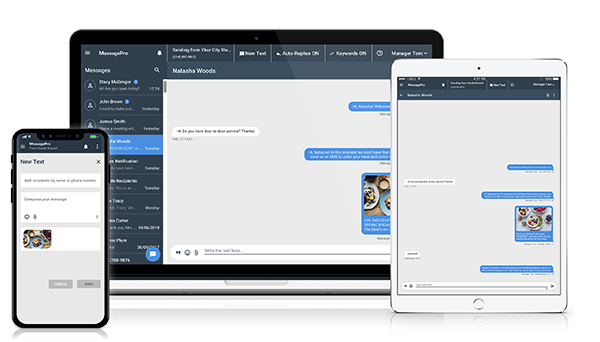 From automatic replies to managing message flow, to easily assigning personnel to specific phone numbers. MessagePro provides BOT-like technologies, automating many routine service questions. Texting costs just pennies. Phone calls can cost $5 or more, so the economics are compelling. Want to Know More About MessagePro for Customer Support? Let’s Talk!